Lovely home in quiet residential neighborhood great for walking running bicycling. I'm leaving a bicycle or 2, snorkeling gear and golf clubs, too. Only 4 mi from Hathaway Bridge, just a short drive to the Beaches and St Andrews State Park. Just a short drive to St Andrews Bay and boat launch at Carl Gray Park. Perfect home for Healthcare providers as we are close by to both Hospitals. 3 bedrooms, 2 queen beds and 1 trundle, 2 full baths, garage is not available for the rental. It is locked out for the owners use. Room for several cars in driveway and 2 spots on street. I will not be far, easy to reach and neighbors are friendly, too. Pets negotiable. This unit is a short drive (approximately 4 miles) to St. Andrews & the sandy white beach off of Beach Drive. Continue to the Hathaway Bridge (about 10 minutes) and you'll be in Panama City Beach's south side near St, Andrews State Park, the beach, restaurants and shopping. 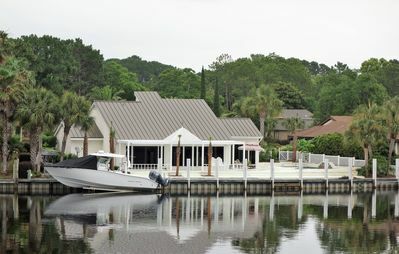 Bayou Pointe is just a 15 minute boat ride (from your private boat slip) to Shell Island, jetty off St. Andrews State Park and restaurants. This Sandcastle is located only 25 minutes form the new International Airport. For a laid back day, try fishing off the dock. You have the best of both worlds in Panama City & Panama City Beach. Muted earth tones, providing a colorful and pleasing Shabby Chic interior. Fabulous views of the bayou and your boat docked right outside your balcony. There is also parking just steps from the front door. Downtown there is the Theatre, Civic Center and the world known City Marina where you can watch the fishing boats bring in their catch for the day. No one under the age of 18 is allowed as per the owner. This is a luxury home on Panama City’s Johnson Bayou that feeds into St. Andrews Bay. Our home is near downtown, St. Andrews and only a short drive from Panama City Beach. This location is perfect for vacationers, business travelers and anyone just looking to relax in a peaceful, quiet neighborhood. Our 3/2 home also has a bonus bunk room. The two downstairs bedrooms have queen-sized poster beds and a shared bathroom with double sinks, a shower and a Jacuzzi tub. The living room is cozy and comfortable with cable television and fantastic views of our bayou. The kitchen features a sub-zero refrigerator, dishwasher, stove/oven, microwave and wine cooler. The laundry has a washer and dryer. The master suite upstairs has a king-sized bed with private balcony overlooking the bayou. A small bunk room with a trundle bed is adjacent to the master. Tons of closet space leads to the master bath, featuring double sinks, and a multi-head shower. We apologize, but the Jacuzzi tub upstairs is out of order and unavailable for use. All the rooms in our home are tastefully appointed for your comfort. Outside, enjoy our large patio deck with outdoor seating and dining areas and a gas grill. Or, sit on the dock and watch the mullet jump. Bring a rod and catch trout, sheepshead, redfish and more from the comfort of your backyard. Come enjoy our waterfront paradise! We’re so excited to offer our space for your use while visiting Panama City, and we hope you enjoy the comfort of our home just as you do your own. With regard to house rules, since it’s impossible to cover every detail, we simply request courtesy and common sense, and if you have questions, please text or call. Video Surveillance: The area between the front of the house and the street is on camera. There is a doorbell camera at the front door viewing towards the street. There are no other cameras on the property. Our rates are based on the number of people staying at our home. Please enter the number of guests you plan to have for an accurate rate estimate. The home has beds for 8, but we will allow up to 10 people in a party. We have one queen sized air mattress. Our town has been through a lot during and after Hurricane Michael. Our beautiful neighborhood has been tattered. Our apartment listed here is in perfect condition. There isn't internet for now. But we have power, water, and air conditioning and heating. A lot of people have been having luck with creating a hotspot with their cell phone for internet. However it is unpredictable. We are located in Panama City Florida so we are a short commute to everything in town. We are extremely excited and proud of this space as we completely remodeled and designed it with our own two hands with loving care. 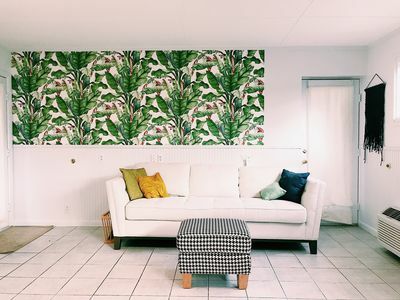 This 650 sq. ft. studio is decorated with vintage modern eclectic theme. Everything in this studio apartment is brand new. And when I say everything I’m talking about new walls, flooring, new kitchen bar, counter, lights, appliances, dishes, dishware, pans. All linens are brand new, bedding and pillows are brand new. All furniture has been purchased as used but all pieces have been perfectly refinished to fit the room setting. I own a refinishing business. I refinish furniture for a living, and I am proud to say this is my best work. Your space is a studio apartment attached to our main home. You will have a private residence with a king bed that has a tempurpedic mattress, a sofa bed, and a comfortable queen blow up mattress. There is a fully furnished kitchen inside of the studio with a flat stove top a microwave blender and coffee maker. You will have your own private bath with shower, shampoo conditioner dispensers, a hair dryer and a vanity with a medicine cabinet. There is a 42-inch screen TV in your private living room that ihas a DVD player. All needed linens are provided along with your own shower shampoo. Conditioner, and body soap dispenser. The room has amazing air-conditioning that comes from our main house air conditioning along with your very own window mount air conditioner. So, during hot summer days and nights you will be able to keep your room as icy cold as you wish! You will have your own private parking in the driveway right in front of your main private entrance. There is also a large parking area along our fence where you can park recreational vehicles or a boat. We are extremely close to our local hospital(s) and emergency room(s). We live close to many convenience stores, gas stations, dollar stores, and the Panama City Mall. Side note: we have 3 beautiful dogs that will not have access to your area. You don't need to have interaction with them unless requested. We also have 2 pot belly pigs that will be in our separate back yard. They will be more than happy to eat your left overs, if we supervise. If we aren't at home, please wait to feed them left overs until we get home. Again, all animals on our property are located completely separate from the residence you will be staying in. We keep the area our pets live in clean so no worries of animal odor or noise. Our animals are indoor as well as outdoor. During the summer months the dogs enjoy the air conditioning so they wont be outside Guest access Private bathroom with shower. Private fully furnished kitchen . Mini fridge,water cooler, and a beverage refrigerator. Stove Top, coffee maker, toaster, blender, cooking utensils, pots and pans, dishes, coffee mugs, drinking and wine glasses, with silverware to accommodate 8 people. A breakfast bar with 4 barstools, and 4 TV trays. Private bathroom with shower and vanity, hair dryer, soap, shampoo and conditioner dispensers in shower. Bathroom is full stocked with 2 towels. 2 wash cloths, and one hand towel per guest. One King bed, one queen blow up mattress and a brand new sofa bed. 42 inch screen TV with WIFI and access to Netflix, Hulu, and Vudu along with a DVD player. Private parking in driveway directly in front of private front entrance, parking for recreational vehicle, boat, jet ski along property fence. Interaction with guests We love meeting people we enjoy being social and if we have the time we can show you around the area and/or guide you to great destinations! If you would like privacy, and no interaction we understand, and we can leave you to yourself. Other things to note We do have 3 dogs and two pot belly pigs. They are friendly and will be kept in our private backyard separate from your apartment. We are open to supervised interaction as our animals always love meeting new people. If you don't want to interact with our pets no worries. The least you will see them is maybe from your vehicle to the door through the fence and the most is up to you! Fully furnished nightly or extended stay apartment in heart of Panama City, FL. It is located in a area called St Andrews. It is 15 minutes from the Beach and just minutes from Hospitals and in town locations as well as restaurants. It is centrally located just off Highway 98 which is the main street running from Port St. Joe, Mexico Beach, Tyndall AFB, Callaway, Panama City, Panama City Beach, Destin, Fort Walton Beach and so on. If you are in town working this is an excellent location for you. If you are in town on vacation this is a convenient location for you as well. A luxury shotgun style home with top tier amenities. The guest studio apartment is located in my back yard at the back of my property. It is very private and quiet. There are 2 new queen beds, a kitchenette, kitchen table and chairs and nice sized bathroom. The kitchen area has a refrigerator, microwave, coffee maker, 2 burner hot plate, toaster,mini blender, sink, pots and pans, cooking utensils, dishes and silverware. There is a large screen smart TV with cable and wifi is available. I live in The Cove, a beautiful area of Panama City, with very tall oak trees draped in Spanish moss. My neighborhood is very safe and quiet. My back yard is completely enclosed with a privacy fence. The pathway to the guest building is well lit at night. I live only 20 minutes away from some of the most beautiful beaches in the world. I also live a short drive from great shopping and fabulous food. Within about an hour drive, there are numerous state parks. You can visit a cave or walk almost 10 miles on a pristine white sand beach. There are local fresh water springs and rivers where people enjoy swimming, kayaking and snorkeling. I really enjoy hosting, because I get to welcome and meet people from all over the world. This is not just a house for rent it is a home with family memories and local history displayed throughout. This home was built by my father in the 1950s. We have just finished a complete renovation, and it feels like a retreat. It has an attached two car carport. Two ingress/egress points: carport door & Bayside door. The carport door opens into a full kitchen with laundry. It has full size appliances with front loading washer/dryer and it is fully stocked with the basic necessities and essentials required for a pleasant stay. The kitchen opens into the family room with games, tv, dvd player, wireless speaker & fireplace. Through the living room you come to the bay room and dining room with huge windows to take in the gorgeous views of the bay, port & marina. The hall off the LR leads to the bedrooms & baths. First you come to the twin bed room that is equipped with a tv & bay view. Next is the full size bed room with bay view. Across from these rooms is the main bath with tub & shower. Further down the hall is the master bedroom with a king bed, private bath, reading area and also with a bay view. Now for the outside. Just outside the bay side door is an outside shower and fenced in side yard. Right next to that is a relaxing brick patio with a wood burning fire pot, table & chairs and beautiful bay view. 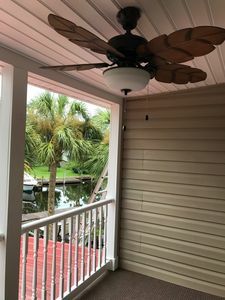 Also on the bay side of the house is a 16'X32' tree shaded deck with chairs, picnic table and benches for you to relax and enjoy the views and the wonderful bay breeze. Four kayaks are stored next to the deck and are available for your use. From the deck and all the Bay side windows you can see the huge grass front yard that leads to your private bay front beach complete with beach chairs, bench swing and fire pit. Take a look at the photos tab to get a taste of what you might see from the beach and/deck. The house is stocked with bath towels/cloths, soaps, detergents, cleaning supplies, hair dryers iron & ironing board, dvds and a special 'forget me not' basket with most anything you might have forgotten. You are also welcome to enjoy the 'put-n-take' library just at the hall entrance. This one bedroom/one bath 'guest house' is part of a duplex. Although the house was once a country store, it has been completely remodeled, including new plumbing and electrical wiring. Cottage has heart pine floors and 12 foot ceilings. The queen iron bed has a memory foam mattress and the efficiency kitchen has granite countertops. 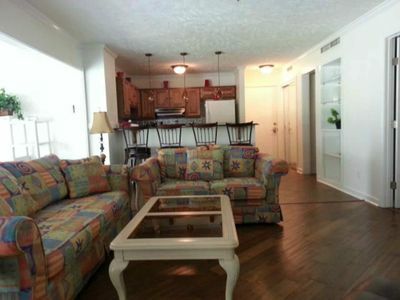 This unit is perfect for people seeking a quiet retreat away from the busyness of the beach. It is a wonderful alternative for business people looking for a more relaxing option than a hotel. It is close to downtown and Bay Medical Center. Well appointed waterfront, coastal lifestyle home. Enjoy boating on the bay, playing on the island, or fishing in the bay or gulf. Patio or pool parties all day into the night. Plenty of room for friends and family. Entertain effortlessly while creating great memories. Two master suites with two more spacious bedrooms ( one queen, one w/ two twins) 3 1/2 baths and a separate upstairs den. Complete with fully equipped kitchen and laundry room. Gourmet kitchen has two subzero refrigerators, perfect for entertaining and storing drinks and food for the weekly accommodations. Waterfront home is Perfect for your family vacation and entertaining. Master bedroom overlooks pool, bay and hot tub. Additional master suite upstairs (two queen beds)has balcony and overlooks the bay. There is plenty of parking. Enjoy renting a pontoon boat or jet skis for the day and parking them out back on the bay. Leave on a boat from the backyard to go enjoy Shell Island and fun in the sand and sea. Additional information and photos available upon request and we are happy to accommodate directions to local restaurants and shopping as well as grocery stores. We are also happy to stock the bar, fridge and freezer’s as per your request for additional fee. Dog-friendly retreat w/ private dock & water views - great for fishing/boating! Our Float Your Boat property was recently taken over for management by the owner from vacassa management co., therefore we had to start the review process all over again loosing all our previous great reviews. 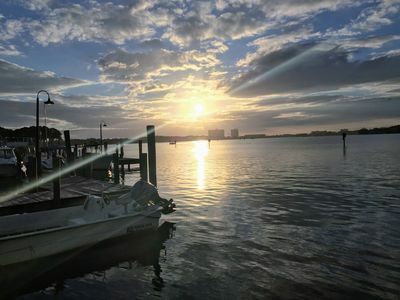 If your looking for a fishing vacation, especially if you have your own boat, then this is the perfect spot for you with space to dock your boat, a marina with fuel and ice 100 feet away. Or take the family or some close friends for a vacation filled with rest and recreation near the white sands and emerald green waters of sunny Panama City Beach! Your location right on the water is great for those looking to explore the warm waves of Florida firsthand, while still staying close enough to nearby cities for shopping and dining. This spacious modular home for 10 is tucked away in a mobile home community in Panama City Beach. 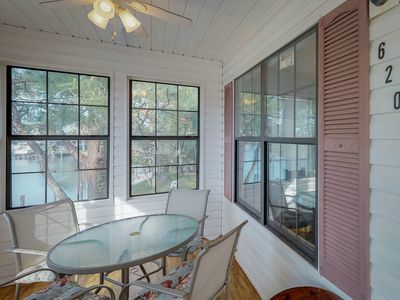 The neighborhood might not be the most scenic, but once you sit for a spell on the screened-in front porch you'll know you've arrived at a hidden gem. The warm waters of St. Andrews Bay are yours to enjoy by swimming or relaxing by the water's edge at Shell Island, which is a pristine barrier island accessible only by boat. 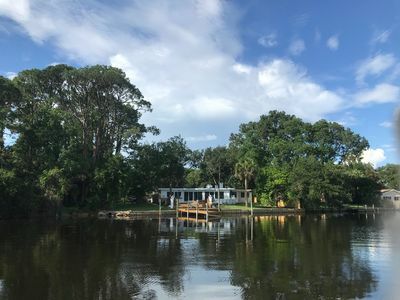 You'll appreciate the 50-foot dock alongside the house (and a boat launch right next door with fuel and bait and ice) to access the deeper bay waters to the east and west on the Gulf of Mexico. Inside, wide windows let in gorgeous views of the shining waters and bobbing boats around you. 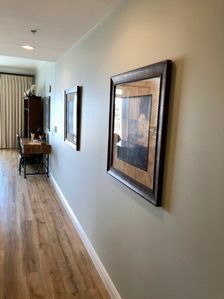 It adds a nice piece of character to the peaceful interiors, with new tile throughout, spacious vaulted ceilings, and high-quality furnishings and paintings. 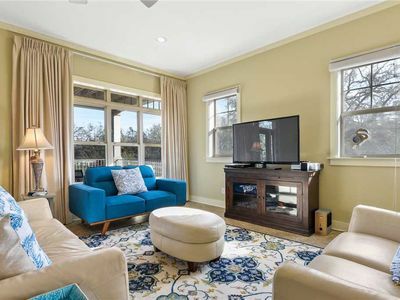 The main living area has two leather sofas that let you enjoy the flat screen cable TV (if you aren't on the screen porch), with a second flatscreen available on the enclosed front porch. It even comes complete with a refrigerator for storing cool drinks as you gaze at the seawall in the distance. Don't forget the front yard by the water. Kick back with a good book under the shade of a gazebo , or use the internet to share photos of the jaw-dropping views. There's also a study with a window facing the water for those looking to telecommute, but don't work too hard - you're on vacation! The kitchen comes fully equipped with everything you need to whip up a truly delicious meal, including a granite kitchen island with four seats (great for the kiddos). Dine at the nearby table for six, or head outside to savor your food in the fresh air. Don't forget to load the dishwasher before bed! Three bedrooms , and a queen-size sleeper sofa in the living room, allow 10 guests to stay in this home at once. The master bedroom features a queen-size bed , flat screen tv, and en suite bathroom with a jetted tub, making it ideal for couples. The second bedroom offers another queen-size bed, and flat screen tv, while kids can enjoy the third room's twin-over-double bunk bed with a twin trundle, also with it's own flat screen tv. Dry yourself off after bathing in the tub - or showering in the second bathroom - and get ready to explore! When you're not jetting around St. Andrew's Bay and the Gulf of Mexico, and enjoying boat rides to the sandy shores of Shell Island or taking in views from a waterfront restaurant on Grand Lagoon, you can hit the road and explore! Panama City Beach is less than five miles away, with family-friendly attractions like Wonderworks and Ripley's Believe It Or Not! to enjoy alongside ample local shopping and dining. Place your reservation today and take the first steps to an unforgettable Florida getaway! *Please note, all guests occupying this property who are under the age of 25 must be accompanied by a parent or legal guardian. Thank you! * Please contact Owner for our special Snowbird pricing! WATERFRONT 2-3 Bedrooms, 2 Bathrooms, Waterfront, Pool, GAME RM/Garage, LOOK! LUXURY WATERFRONT HOME on the Panama City Beach Area, Located in a nice GATED COMMUNITY. SLEEP UP TO 10-12 GUESTS. Home is 2 Br, 2 Ba + Sunroom set up as a 3rd Bedroom. Home is located in a gated waterfront community! Water views are abundant from almost every room in these homes! 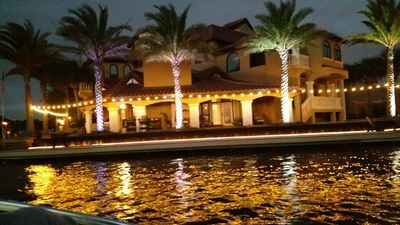 Fish from your private sun deck on this canal on Panama City Beach! 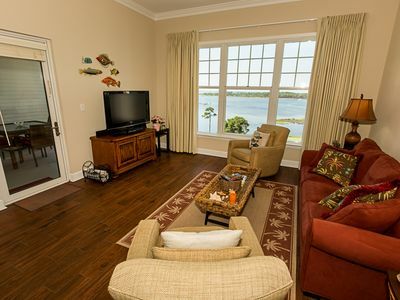 Relax in the 2 Screened In Rooms on the back decks, overlooking the water. Enjoy the quiet community SWIMMING POOL, PRIVATE SUNDECK & PRIVATE GAME ROOM/Garage! Yes, you will be to enjoy your own PRIVATE POOL TABLES, AIR HOCKEY & FOOSBALL TABLE! Free Fishing available in the private lake/canal & no Fishing License Needed! Use our FREE use of our $150 Beach Package & FREE Tennis Package! Relax in the Large SCREENED ROOM located on the canal. The crystal white sands of the beach are less than 10 minutes away. Enjoy the community club house, tennis courts and shuffle boards. Large living area and a separate dining area. The master bedroom suite has a large garden style tub, a separate shower and a walk-in closet. The 2nd bathroom has a full tub/shower enclosure. A LARGE SCREEN TV & DVD/MP3 PLAYER are in the living room. FREE HIGH SPEED INTERNET!! ELECTRIC CART RENTAL! : Yes, we have an optional Electric Golf Carts available. Rent one of our 4 Passenger Electric Golf Carts. These carts are not for golfing, but are used in the neighborhood. Cruise back and forth to the Swimming Pools, Tennis Courts, Shuffle Board or over to a local pub. The carts are all electric, so save gas and time parking! What a great way to enjoy the beach. 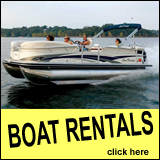 BOAT RENTALS! : Do you like to fish! If you really want to take your vacation to the next level. Rent one of our electric boats for your stay. The boat will be docked at Lullwater Lake on the West end of Panama City Beach near Pier Park. Lullwater Lake is approx 40 Acres in size. This is the LARGEST FRESH WATER LAKE on Panama City Beach! There are Large Mouth Bass, Sunfish, Catfish and other varieties of fish in this lake. You will get use of an Aluminum Boat, Electric Motor, Battery, Battery Charger & Life Vest. Just bring your fishing poles & tackle. You will have 24 access to your boat & and access to charge the battery. What a nice package! BEACH CRUISER BIKES AVAILABLE! : Yes, you can get some exercise and save fuel! Rent our beach cruiser style bikes. These are bikes with large tires and handle bars that will keep you seated upright. The bikes come complete with locks. Surfboard Rentals - Ron Jon Fiberglass surfboard available for a fee. Beach Metal Detectors - Yes, we have Optional Beach Metal Detectors to help find treasures at the beach. Additional charge. Looking for a place where two can enjoy a peaceful getaway near the beach? You’ve found it in 2214 Cochran at Bear Point in Panama City Beach, Florida. This welcoming four bedroom condo gets you near the beach and a view of the Bay, plus everything else you'd want to experience while on vacation. There is a one-week minimum stay required at Bear Point 2214, but with everything there is to do and see in this fun-filled area, you’ll need every one of those days and more! Located near Panama City and Destin Airports, you luckily won't have to travel far to find your destination. From the moment you enter 2214 Cochran at Bear Point, you’ll appreciate the open design of the 2700 square foot condo. As an open, four bedroom condo, every area flows together to create an inviting environment for your vacation. With everything in reach, nothing is cut off or isolated, excellent for creating that intimate feel. You can even post photos to social media, using the high-speed WiFi that is throughout the whole house or kick back on the sofa and enjoy the Dish TV. Dress your senses in a coastal theme when you're in this snug abode. Your living area is outfitted with a comfortable couch situated to give a great view of the flat-screen TV with Dish and DVD player. If you’re eating in at 2214 Cochran at Bear Point, you’ll find a kitchen with stove and oven, a refrigerator, and a dishwasher. Nothing is lacking in this well equipped cooking space. You can use the spacious countertops for meal prep while you serve you and your guest up some good eats. During your days you’ll never lack for something fun to do. If you do decide to leave the 2.5-acre property (with only 7 townhomes on the whole property, there is room to roam), you won't have to go far to find adventure! Take your vehicle out of 2214 Cochran's garage and hit the road! You can visit WonderWorks to play laser tag or take in a space discovery adventure. Enjoy some fun at Captain Anderson's Marina Shell Island The stunning St. Andrew's Park is just minutes away. There’s also Gulf World Marine Park and Pier Park with its excellent shopping, restaurants, and entertainment. 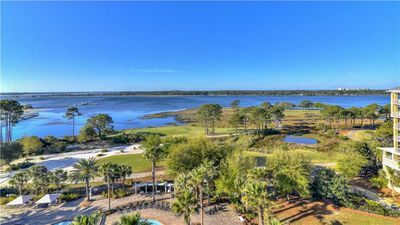 And as a special treat for any golf players in your group, 2213 Cochran is very close Meadows Course and Nicklaus Golf Course at Bay Point, which is the first and only Nicklaus Design in Northwest Florida. Whether you are into water skiing, snorkeling, surfing, boogie boarding, kayaking, sailing, eco-touring, parasailing, hiking, biking, windsurfing, or scuba diving, 2214 Cochran has something for you! Get away from your everyday life and enjoy a little “we” time on the silky white sand beaches of the Gulf of Mexico. 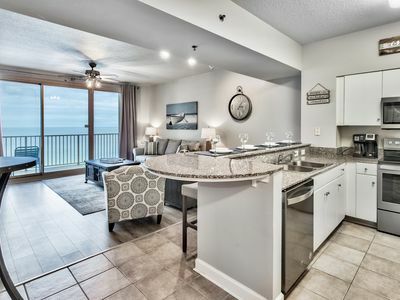 You’ll create excellent memories when you make 2214 Cochran at Bear Point your vacation headquarters in beautiful Panama City Beach. Book your stay today in this attractive, well-located vacation property today! Waterfront on Bay! Sleeps up to 25! 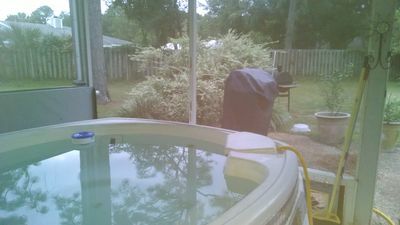 PRIVATE POOL/HOT TUB/BOAT 4 RENT! Panama City Beach’s best kept secret! Spend your vacation at this beautiful, mid-century modern, 5bed/5bath, waterfront Ranch with bay/2 dock access! Short-term lease agreement executed upon booking. Fisherman’s Paradise Have a Boat? B.Y.O.B! (Bring your own boat) Just a few minutes away from the closest boat ramp! Double dock access with our property! You can tie it up while you stay! Need A Boat? Rent one for the week from us! Lowe SS250 25' TRI toon - better than a pontoon! $215 a day or $550 for three! (three day minimum when booked over a major holiday) Outdoor fish fillet station - clean your fresh catch of the day for dinner after enjoying the water on your boat or ours! Handicap Accessible Home This is a handicap accessible home. Fully ADA compliant in one of the bedrooms & bathroom with access throughout the home except for one step down that would require going out the front door and around the home to enter from that level. High threshold entering back into the home that might require third party help getting over. Plenty of Parking RV parking space in driveway Space for your boat trailer if you take it down with you. Recently rebuilt driveway that can fit at least 12 vehicles (if you don’t have a boat trailer or RV parked in the driveway). 7 can fit if parked correctly without having to move cars to get in and out. The Bay is Best! Let me tell you why the bay is better than the beach... The property is only a 9 minute drive to the beach! Walk into the backyard and hop on our boat (or yours) and ride minutes to multiple restaurants! 10 minute boat ride to Shell Island. If you aren’t familiar with this island, please visit this TripAdvisor page:https://www.tripadvisor.com/Attraction_Review-g34543-d1474540-Reviews-Shell_Island-Panama_City_Beach_Florida.html Privacy! In your own backyard! Your own private paradise! Watch dolphins as you drink coffee in the hot tub on our back porch. Enjoy a cookout with the family while the kids swim in the private pool. Watch the sparkling water of the bay at sunset instead of other beach goers prancing through the sand behind your condo or hotel. Room for multiple families! 3+ families can easily stay here! 3 bedrooms with King Beds 2 bedrooms with Full Size Bunk Beds (sleep 4 people each) and a twin bed. Two queen pull out sofas in the living areas. Three full sized blow up mattresses available to be used in the home. Tons of extra space in two of the masters and living areas for the blow up mattresses. Home was built as two masters with their own private bathroom suite each. Total of 5 Twin sized trundle Beds under the King Beds (each King Bed in the two masters have two trundles underneath) Two full kitchens in the home including large refrigerators, dishwashers, stoves and cook tops. NO SPECIAL EVENTS OR PARTIES. 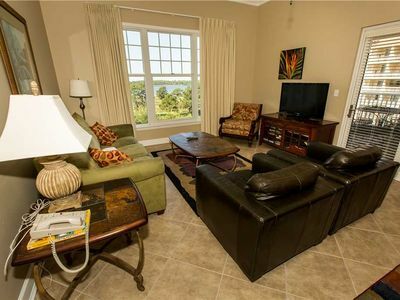 Enjoy the peaceful serenity of a gated community at this 3BR/2BA vacation home, situated beside a beautiful pond in Panama City Beach. The Gulf of Mexico and a sugar-white beach are within a 5-minute drive. This rental boasts gorgeous water and nature views from a private screened porch and patio complete with an outdoor dining table. Gather in the inviting open-concept main living space, and create tasty vacation meals in a well-stocked kitchen. Enjoy a host of community amenities, including two swimming pools, tennis courts, shuffleboard and other sports facilities for family-friendly fun. ABOUT THE HOUSE Relax in the bright and airy living room, furnished with a sleeper sofa, a pair of comfy chairs, and a 60” flat screen TV. Head outside to your private patio with a gorgeous waterside setting. A large patio table seats four—a great place to take in the view while you dine. 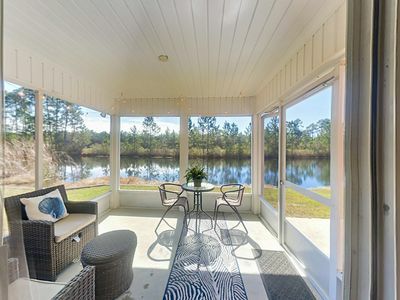 Steps from the patio, a screened porch also has seating for four and more lovely waterside views. Well-equipped and spacious, the kitchen has a breakfast bar for two, classic white cabinetry, and stainless steel appliances. Meal prep is easy thanks to plenty of utensils, dishware, and baking equipment. When you’re ready to eat, a wooden dining table has seating for four. The master bedroom features a king-size bed, large walk-in closet, and a 52” wall-mounted TV. An en-suite bathroom has a tub/shower combination. The second bedroom comes with a full-size bed, 36” wall-mounted flat screen TV, and storage closet. While guests in the third bedroom have a queen-size bed, storage closet, and a tube TV. A guest bathroom is configured with a tub/shower combination. Guest amenities include complimentary Wi-Fi, cable TV, a washer/dryer, and three parking spots (two in the driveway and one in the garage). THE LOCATION Drive 5 minutes to the Gulf of Mexico for a day on a glorious, sugar-white beach. Or head 15 minutes for a fun-filled day at Pier Park — a sprawling entertainment venue packed with shops, restaurants, activities, and seasonal events. Just 7 minutes away, Race City offers a great family day out with rides, arcades, go-karts and a blacklight mini-golf course. While 8 minutes away, Wonderworks is a must-visit interactive attraction with over 100 interactive science exhibits, and a 6D motion ride. As for the local dining scene? The Egg & I Restaurants is a great spot for breakfast, Fatty Patty's Cakes & Cafe is your go-to for brunch, and Sake House II serves up tasty sushi. All three options are within a 5-minute drive. THE TURNKEY ADVANTAGE Your vacation rental is TurnKey Rental Certified. All photos, calendar, and rates are 100% accurate. We will notify you proactively when early check-in and/or late check-out are possible. You'll receive the comforts of home with a starter supply of shampoo, soaps, paper products and hotel-quality towels and linens. We make it easy to stay with us! Drive straight to your rental and access the home with your unique lock code. When you book, we will send you our mobile app with directions and home instructions. We’re available 24 hours a day with live help. All TurnKey rentals follow local/state tax rules. Each reservation includes applicable taxes, cleaning fee, and Property Damage Protection policy. THE SETTING: “Fiddler’s Green” is a uniquely romantic and beautiful beach house on 2 private acres with an oyster shell drive. It was built in 1961 and totally renovated in 2005. The property has dozens of huge trees and 800 feet of private bay front and bayou shoreline. The house sits amidst pines, magnolias, and oak trees hung with Spanish moss. St. Andrews Bay is about a mile wide at this point and naval and commercial shipping vessels are commonly seen going in and out of the bay, providing an enjoyable spectacle. The wildlife is similarly interesting, with the bay attracting many birds including egrets, herons, pelicans and the like. Dolphins occasionally swim up under the dock. (Please see the video! And remember to turn on your sound when you do) A long thin spit of uninhabited land provides a nice morning beach walk and divides the bay from the bayou; it is home for a group of deer which you are likely to see. The bayou is usually inhabited by an alligator who keeps the fish jumping. (Fishermen are especially fond of this area!) 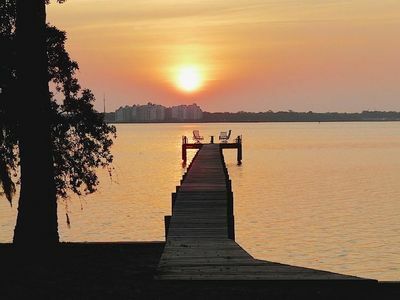 Morning sunrises are spectacular across the bay and in the evening the twinkling lights of St. Andrews create a fairyland view from the house as well as the dock. THE HOUSE: Is beautifully decorated with antiques and art and is extremely comfortable. The large and fully equipped kitchen has a copper-topped bar open to the water view and to the large central living space which comfortably accommodates all sorts of activities: dining, reading, conversation, TV, fireplace, projects and games. It faces a window wall featuring a 180-degree panoramic view of St. Andrews Bay, providing the constantly changing scene of wildlife and boating activities. There are three bedrooms each with its own bath. Two have queen-sized beds and bay windows with window seats and gorgeous views. The third has extra-long twin beds which can be combined for one king-sized bed. The master bath offers two separate sinks, enclosed toilet room with bidet feature, claw-foot tub, separate stall shower, and walk-in closet. Other rooms include a private office off the kitchen with his and her desks and a laundry room. CHILDREN: Are welcome at Fiddler’s Green. The beach abounds with fiddler crabs and hermit crabs which children typically delight in observing or capturing for play. There is a swing that is set among the pines with long, long chains, for a long smooth ride. It is convertible for toddlers’ use. There is a portable crib available for infants in the linen closet. THE BAY and THE DOCKS: The long dock allows for boating but is also a perfect outdoor room for morning coffee and the sunrise or evening cocktails under the stars with a cooling breeze. There are 4 swivel-tilt chairs to allow you to follow the clouds and the wildlife. There is another small dock on the bayou useful for jet skis, canoes, kayaks or small fishing boats. Because tides are variable and can be quite low, the boat you rent or bring needs to have a shallow draw. For a group, pontoon boats work well and are easily rentable at several nearby boat rental facilities; St. Andrews Marina is directly across the bay and provides boat services and gas. OUR RESTRICTIONS: We will allow only small well-trained pets who you feel confident would not scratch or dirty the furniture. A pet deposit of $300 is required. It will be refunded upon inspection after the guest leaves. We strictly limit the number of overnight guests to 6. 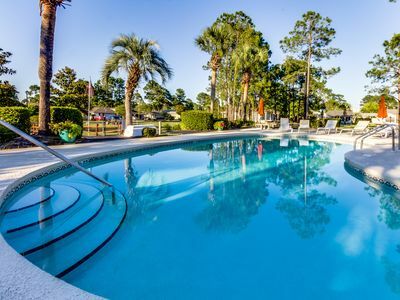 WHAT’S NEARBY: There are two highly rated golf courses within two miles of the house and the nearby Wyndham Bay Point Resort also offers tennis, a spa, restaurants and various other services. 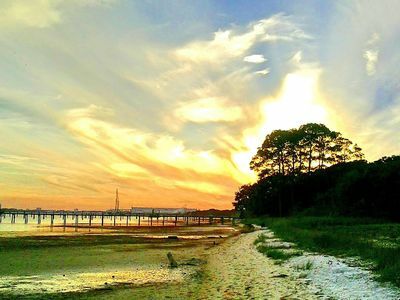 St. Andrews State Park is renowned as having “one of the most beautiful beaches in the world.” It is set in the midst of a beautiful 1100 acre wildlife sanctuary. It is only a short drive away as are numerous restaurants including the famous Captain Anderson’s, that offers ferryboat rides to Shell Island and dinner cruises as well as a delicious menu. 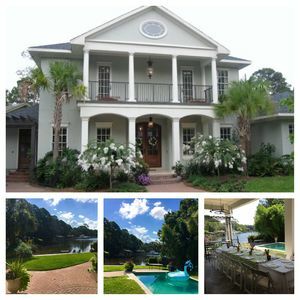 Keywords: pet friendly, private, boat friendly, oak trees, Spanish moss, child friendly, jet ski, wonderful fishing, bird watching, antiques, beautiful furnishings, spacious house and grounds. Bayside Bungalow is a newly remodeled 3bdr/2ba with all the amenities of home. A short drive to the sugar beaches of St Andrews State Park, Shell Island Ferry, Miracle Strip, and Pier Park. Located just over huge Hathaway Bridge, this home is in a quiet neighborhood and underwent a complete remodel in 2014. With all the modern comforts of home and an 'Old Florida Charm', enjoy the custom kitchen, 'butterfly room' with 2 twin beds, cozy second bedroom with a double bed, and a master suite with spacious bathroom with full sized washer and dryer. 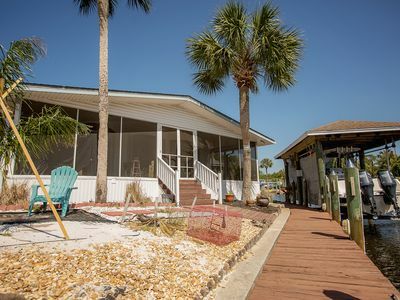 Dock your boat along the 65 ft sea wall, shower away the sand in the outdoor shower, and relax on the spacious screened in porch. The canal is perfect for pleasure or fishing boats. 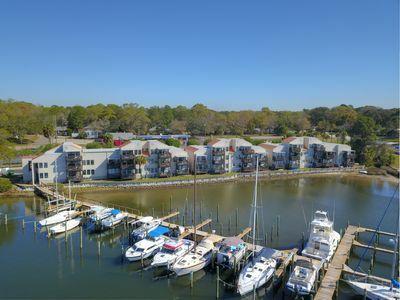 Neighborhood marina is within walking distance. You are minutes by boat to the best fishing and beaches in the world. By car you are just 15 min to the best beaches in the world. Free wifi and cable tv. The master has a queen bed and its own bathroom with a full size tub, washer and dryer. Bedroom 2 has two twin beds, and the third bedroom has a double bed. The second bath has a large walk-in shower. The front entrance has a ramp for easy entry And the back has a screened in porch over looking the canal. E1501 is a fully furnished spacious 1975 sq.ft. three bedroom unit that accommodates up to ten guests. All rooms feature floor-to-ceiling glass and sliding glass doors facing the Gulf for great views from inside or from the approximately 60 feet long balcony on which are regular and high chairs, tables, and a lounger. The living room has a flat screen TV/cable, VCR, DVD, stereo, love seat, sofa pull out queen size sleeper, and an oversized swivel/rocker recliner. The dining area includes a table for six and a bar that seats three. The remodeled kitchen is fully equipped and unusually well stocked with cooking , eating, and entertaining wares, has a great deal of counter space, two microwaves, a glass top stove, and a side-by-side refrigerator/freezer. The master bedroom suite has a king size bed, a flat screen TV/cable and DVD player, and a glider chair. In addition to the master bath, which features a large ADA-compliant walk-in shower with fold-down seat and grab bars, there is a separate dressing area with sink, counter space, drawers, etc. The second bedroom has a queen size bed, a flat screen TV, a rocker/recliner, and additional chair. The third bedroom has a queen size and a double bed, a flat screen TV, a chair, and its own small private balcony with two chairs and a small table. The guest bathroom has a tub/shower combo. The unit has a full size clothes washer and dryer. Our property is TurnKey Rental Certified. All photos, amenities, calendar, and rates are 100% accurate. We will notify you proactively when early check-in / late check-outs are possible and you'll receive the comforts of home with a starter supply of shampoo, soaps, paper products and hotel-quality towels and linens. And we make it easy to stay with us! Drive straight to your rental and access the rental with a unique lock code that we give only to you. When you book, we will send you our mobile app with directions, lock code, and instructions. We’re available 24 hours a day with live help. All TurnKey rentals follow local/state tax rules. Each reservation includes applicable taxes, cleaning fee, and Property Damage Protection policy. 2 queen beds 1 sofa sleeper Sleep 5-6 people. Perfect resort vacation place for everyone. Golf, Spa ,marina, pool, walking trails. bike riding, restaurant's, snorkeling,Shell Island tours available every hr. You will be close to St Andrews State Park, Pier Park Shopping has added a New North Addition this year. Wonder works. This is a vacation place for all ages. Stay here you will love this place. Panama City Beach with The resort Life and security. This is the vacation place you don't want to miss. This is a first time rental and has all the comforts of home. Bring your personal's clothes and Food. You will have the great vacation memories that you will want to come back and enjoy to add to the great vacation memories next year. Beautiful studio apartment located on the east end of warm Panama City Beach that has a rich tropical coolness you’ll love! Inside the natural light and cozy energy of the apartment will charm you. Wake up slow & refreshed to the soft chirping of birds and a warm glow. By not staying in a condo surrounded by 1000s of other visitors you can take your time! Where you will be located you won’t be fighting traffic only 1.3 miles from the beach! Its a Beautiful private space with a cool tropical Florida style with one queen bed and one queen sleeper sofa both brand new and modern high top table the studio has a very open feel; the longest wall is lined with windows that fill the room with natural light. The pocket kitchen is the perfect space to whip up a quick snack on the stove top or lay out your meal buffet style if you decide to order in pizza or Chinese. The full bathroom has both shower/bath and vanity style lighting to shave or put on makeup for a night out. ***PLEASE NOTE: ALL RATES QUOTED BELOW ARE BASE RATES NOT INCLUDING TAXES OR FEES. *** ***Monthly rates available by inquiring, please let me know if this is of interest by messaging me the dates you are interested in. Short term monthly & long term monthly rates available. Are you a diver (or want to learn), spear fisher, hook & line fisher, golfer, or just love the water? 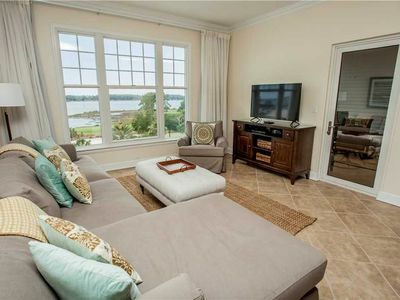 Do you like to relax on the couch and watch the sunset over the water through the back windows? This gorgeous, one level (no steps/stairs) villa has the Panama City Diving charter boat directly 55 steps behind the back deck. The villa is waterside in the exclusive Baypoint Golf & Marina gated subdivision, with the water and marina on one side, and two golf courses on the other side. The golf clubhouse and pro shop are walking distance from the villa. Bricks & Barley restaurant, with its excellent pizzas, calzones, sandwiches, beer and wine selections, and small grocery area, is just 75 steps from the back door. The villa is updated with new appliances, tile floors, new furniture, kitchen totally equipped, new bedding and mattress, new washer & dryer in the unit. Flat screen TV's in living room and both bedrooms. The master bedroom has a king-sized bed, the second bedroom has a full-sized bed (with fantastic water views) and the leather couch turns into a full-size bed. The main bathroom has a walk-in shower. The large back deck has seating/dining area, with umbrella, beside the water and marina! A block down in the neighborhood is access to two public pools located in Sheraton Resort at Flip Flops Bar & Grill by the water, with awesome views and sunsets. Beside Flip Flops is the boardwalk, which leads to Pelicans restaurant above the water, on the boardwalk, which also has amazing sunsets. Next to Pelicans, on the boardwalk, is the dock for the Bay Point Lady, a water shuttle to Shell Island and back. There are also jet ski and pontoon boat rentals there. There are also a Publix (with pharmacy) and Winn-Dixie grocery stores just off Bay Point property. The villa is walking distance to diving, golf, tennis, restaurants, snorkeling tours, charter fishing, other water activities, and tiki bars. The Steel Slinger, Panama City Diving’s dive charter boat, is docked directly behind the villa. Step out of the back door of the villa, and in approximately 55 steps you are on the boat! We provide a cart to pull your diving gear to the boat. The folks at Panama City Diving are all amazing people, excellent diving instructors, and great friends. Pat and his crew run a fantastic and friendly shop. Most are experts/professionals at spear fishing, and can teach you as well. There is even a very nice fish fillet/cleaning table on the dock beside the boat. They are also family friendly and always do all they can to take care of their customers, and make sure they have a great family experience. This property is "almost like" a live aboard dive ship. You can: wake up in the morning; load the cart with your dive gear; walk to the Steel Slinger for a day of diving; grab dinner at Bricks & Barley next door; get a night’s rest; and do it all again the next day, without ever getting into your car! Just across the lagoon, there is excellent shore diving and beaches at the jetties at St. Andrews State park. You can actually see the park from the villa. We provide a family pass for free access to the park, which stays in the villa. St. Andrews has many things to offer in addition to shore diving. There is a full surf, gulf facing beach for regular beach activities and the "kiddie pool' beach, which is sheltered from the surf waves, and is mostly shallow, so it is perfect for children. The kiddie pool area is also great for shell hunting, because it has many unbroken shells that wash up on the beach. St. Andrews also has another shuttle to shell island; pavilions for picnics; nature trails; fishing; a general store; deer throughout the park, and even an alligator pond. As the crow files, St. Andrews is a mile or less from the villa, but, unless you swim across the lagoon (don't recommend that) you just have to drive around the lagoon, but it is extremely close. Thanks again for considering our villa! Enjoy your vacation! Reflections 410 - Relaxation Ahead! 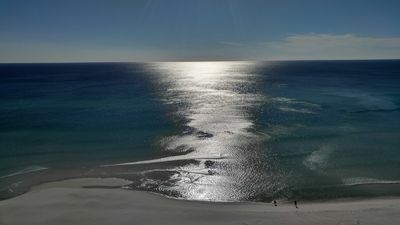 Reflections 410 is the perfect getaway for couples and families in the luxurious Bay Point of Panama City Beach. With two spacious bedrooms, there is no shortage of relaxation at Reflections 410. As a guest of Reflections 410, you may enjoy unlimited access to the pool and private beach area down the Reflections Pier. Boats and jet skis are easily rented in the Bay Point Marina, less than a minute drive away from the condo. Golf course, gym, and spa all on site! HOUSE RULES - Please no smoking or pets allowed on premises. - Unit available for Couples/families only. Responsible Adult must be age 25 or older. An additional informational sheet will be message no later than a week prior to visit with checkout instructions. Persons/Groups renting through website that are found to be outside this criteria are subject to removal and loss of full rent and deposit upon check in inspection, or concierge visit. -Administrative services will be on call, while cleaning services are available when necessary. Office Hours Monday to Friday 9:00 AM - 5:00 PM CST. Calls and text messages outside of office hours will be answered as soon as possible, while emergencies must be addressed via VRBO messages for immediate response. NEW LISTING! Bayview condo with shared pool, hot tub, and private balcony! Reflections at Bay Point #507 Our calendar is updated in real-time & our nightly rates are accurately displayed. Simply enter your desired dates and click 'Book Now!' This comfortable condo offers everything you need for a romantic getaway! 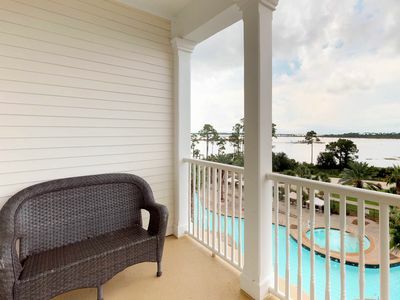 The spacious balcony offers views of the pool and the bay, as well as Saint Andrews State Park and Shell Island. The open floor plan and oversized bathroom make this the perfect place to settle in and make yourselves at home. You will also have access to a shared pool and hot tub. Nearby: The gated Reflections community is located in an ideal location, with many boating and watersports options at the Bay Point Marina. The elevator will take you to one of the best salon and spa locations in the area. This location is also a short drive to restaurants, shopping, Saint Andrews State Park, and much more! Need to know: Free WiFi Full kitchen Building has an elevator Not pet friendly Parking Notes: Do not park in the spaces marked "Permanent Resident Parking Only"
A SLICE OF SERENITY !!!!!!!!! THIS PROPERTY IS LOCATED OFF THOMAS DRIVE IN EMERALD POINTE RESORT.THIS IS A QUIET, LOW KEY GATED COMMUNITY TUCKED AWAY FROM THE HUB BUB AND TRAFFIC .IT IS FAMILY FRIENDLY AND OFFERS TWO POOLS ,A HOT TUB AND A WORKOUT GYM . 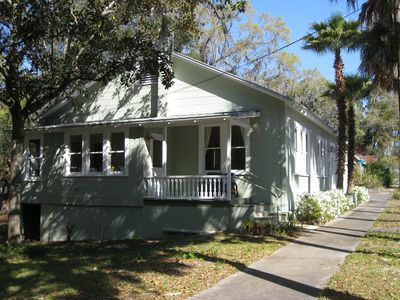 GREAT FOR BIKE RIDING AND/OR TAKING A BRISK RUN / WALK.UNWIND AND RELAX IN THIS PEACEFUL LITTLE TUCKED AWAY NOOK AFTER A LONG DAY AT THE BEACH , SHOPPING ,MINIATURE GOLF,AMUSEMENTS, WONDER WORKS OR WHATEVER THE DAY MAY BRING.THIS IS A 3 BEDROOM 2 BATH HOME WITH KITCHEN, EAT IN DINING TABLE,LIVING ROOM AND SMALL BACK PORCH .OFFERS A 2 CAR COVERED CARPORT AND FUN DECOR INSIDE.ONE KING SIZE BED ,ONE FULL, AND ONE DAYBED ONE TRUNDLE.SLEEPS 5 /6 VERY COMFORTABLE.STACKABLE WASHER AND DRYER IN BEDROOM .THE HOME IS VERY CLEAN AND MAINTAINED FOR MY GUESTS . I JUST PURCHAED A NEW REFRIGERATOR,A NEW ABOBE THE STOVE MICROWAVE AND NEW KIT HEN FAUCET DECEMBER 2018.ONE LIGHT AWAY FROM MARATHON GAS STATION WHICH OFFERS THE BEST CUBAN SANDWICHES AND CHICKEN SALAD.JUST DOWN THE STREET WINN DIXIE, PUBLIX ,WAFFLE HOUSE DOLLAR GENERAL AND 2 PIZZA PLACES.ST ANDREWS PARK AND THE FAMOUS CAPTAIN ANDERSONS RESTAURANT ALSO MINUTES AWAY,SCHOONERS ,DIEGOS, ANDYS FLOUR POWER ,DUNKIN DONUTS AND BRUSTERS ICECREAM.THE INFAMOUS PATCHES A LOCAL BAR 3 MILES FROM HOME. 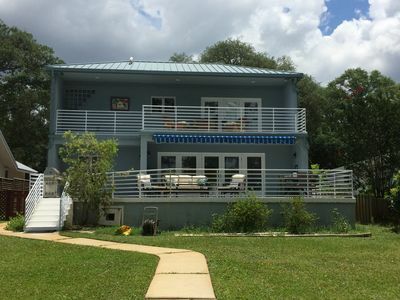 IF YOUR LOOKING FOR ADVENTURE AND FUN DURING THE DAY BUT A QUIET PLACE TO RETURN IN THE EVENING THEN THIS IS THE PLACE FOR YOU.This property is not on the beach its a 3 mile drive to the east end of the beach. Beautiful canal home with 120 ft of water front access. Relax in the comfort of this waterfront home, watching the sunset from the deck. Swim with kids, sunbathe on the deck. If that's not enough, the beach is just a few minutes away by car. The gated community of Bay Point has so much to offer to include tennis, golf, and boating. Several restaurants are with the neighborhood and just a short golf cart ride away. Shores of Panama 1013~ Booking Now for Spring. New Condo & Updates Coming! Shores of Panama ~10th floor ~Vacation Life Properties Shores of Panama is a 23- story Gulf- front luxury resort located in the heart of Panama City Beach. The resort features over 14,000 square feet of pool space, indoor and outdoor with hot tubs, a full spa, modern fitness center with brand new equipment and 2 pool side Tiki bars. There are beachside activities and watersports as well as chair/ umbrella rentals on site. Shores of Panama also provides reserved, covered parking and facilities for large events. Just steps away from everything you could need- Wal- Mart is across the street, and you are just moments away from Pier Park, Panama City's premier shopping and dining area. Pineapple Willy's Beachfront Bar is just steps away, as is Ripley's Museum, Signal Hill Golf Course, mini golf and tons of restaurants. 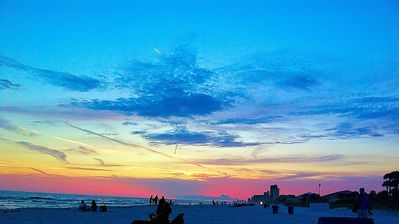 You will have a great time on your vacation, no matter where you go in PCB! We book Saturday to Saturday from the end of May through mid- August. Please confirm your exact dates when booking. We have Secured WiFi in our condo. Thank you! Shores of Panama 1030~ Booking Now for Spring. Completely Remodeled Gorgeous Unit! Shores of Panama ~10th floor ~NEWLY REMODELED~ Vacation Life Properties Gorgeous, TOTALLY REMODELED unit at Shores of Panama- you do not want to miss this one! Beautifully decorated and featuring all NEW furniture and appliances, you will love spending your vacation in this King Bedroom with Bunk Room unit. Step into the all NEW kitchen, complete with granite counters, stainless steel appliances, white cabinets and all of the small appliances and utensils you will need. Enjoy your morning coffee at the kitchen bar, or over in the separate dining area. The open concept layout offers plenty of space and amazing views from every angle, and has all NEW flooring and furniture. The living area has plenty of seating and a large flat- screen TV, which is perfect for movie nights! Step out onto your private balcony and watch the sunset every evening with your guests. The Master bedroom features a King bed, with all NEW bedding and decor. There is ample storage space and your own bathroom, complete with Ritz- Carlton quality linens. This bedroom also has its own flat screen TV. It's a retreat unto itself! The Bunk Room features a door for privacy and 2 twin beds, and also has new bedding. There is an additional FULL bathroom, and there is also a NEW, full- sized Washer & Dryer in the unit as well. You will never want to leave! Shores of Panama is a 23- story Gulf- front luxury resort located in the heart of Panama City Beach. The resort features over 14,000 square feet of pool space, indoor and outdoor with hot tubs, a full spa, modern fitness center with brand new equipment and 2 pool side Tiki bars. There are beachside activities and watersports as well as chair/ umbrella rentals on site. Shores of Panama also provides reserved, covered parking and facilities for large events. Just steps away from everything you could need- Wal- Mart is across the street, and you are just moments away from Pier Park, Panama City's premier shopping and dining area. Pineapple Willy's Beachfront Bar is just steps away, as is Ripley's Museum, Signal Hill Golf Course, mini golf and tons of restaurants. You will have a great time on your vacation, no matter where you go in PCB! We book Saturday to Saturday from the end of May through mid- August. Please confirm your exact dates when booking. We have Secured WiFi in our condo. We have Private reserved parking on the same 10th floor. Thank you! 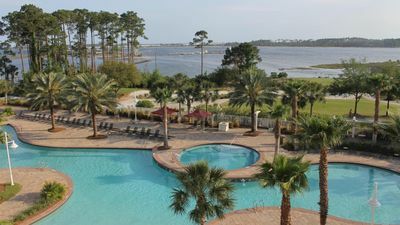 Welcome to Reflections at Bay Point Resort, a master planned community in Panama City Beach surrounded by the serene waters of the Grand Lagoon. Our unit is on the ground floor, so no elevators or steps, with perfect views of our incredible resort style pool that is only steps away! Professionally painted and appointed, our condo has new updated furnishings with flat screen TV's in the living room and bedrooms. Cable and free WiFi access is provided. The master bedroom features a king size bed with top quality linens and private access to the screened-in patio. The master bathroom features a large walk-in shower with his & her sinks for your total comfort. The guest bedroom features a queen size bed with the same quality linens. The kitchen has granite counter tops, SS appliances, and all the accessories and conveniences you are used to at home. The open floor plan of the kitchen and living room allow gorgeous views from the expansive picture window and access to the screened-in patio where you look out to the pool, golf course and lagoon. You will enjoy the palm trees, marsh grass, herons and lots of other native wildlife! Our 10,000 sq. ft. resort style pool is second to none! You will LOVE our condo! 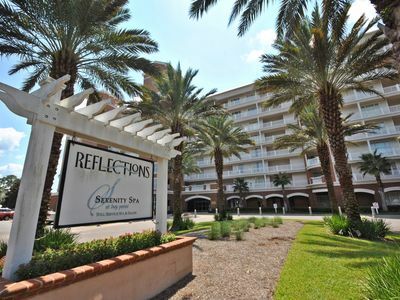 You will find Reflections an intimate & friendly environment, offering many amenities throughout Bay Point. The outdoor spaces make Reflections a truly wonderful vacation spot. We have two golf courses, marina, swimming pools, parks, walking & bike trails, tennis courts, water sports, spa, fitness center, restaurants and so much more. We also boast our scenic pier that meanders through the marsh waters to our private bay beach for great sunsets. Water sports rental and Pelicans restaurant on the pier is open seasonally for your adventure pleasure! 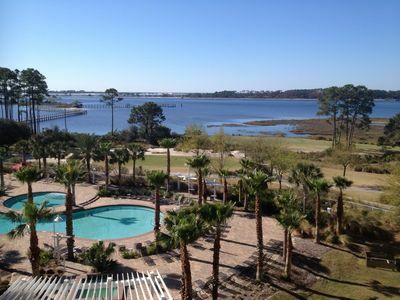 We invite you to visit our condo at Reflections at Bay Point Resort. You will be happy you did! SPA! Serenity Spa is just steps away for all your Spa needs. They offer all-inclusive Resort Spa Packages to make your Florida Vacation one to remember. The best Spa around and you will not be disappointed! GOLF! Tucked in the middle of the Lagoon and St. Andrews Bay is the Bay Point Resort Golf Club. They offer two great golf courses. The signature course is the Nicklaus Course, which is the first and only Nicklaus Design in Northwest Florida. The Meadows Course is a classic old Florida layout that members and public guests enjoy playing day after day! Both courses are just a short walk from our Condo. TENNIS Anyone! Bay Point offers 5 meticulously maintained lighted clay courts. Clinics and lessons are offered as well as leagues. Courts are within walking distance to Reflections. BOATERS! Bay Point is a boater’s paradise! Bay Point Marina is within walking distance to Reflections. 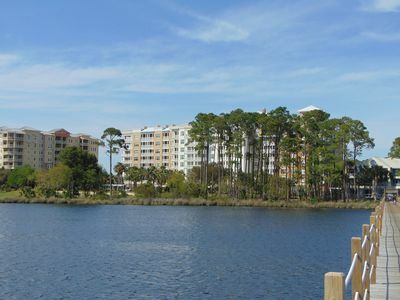 The location and amenities make it one of the top Marina’s in Northwest Florida. This Condo / Resort has it all. 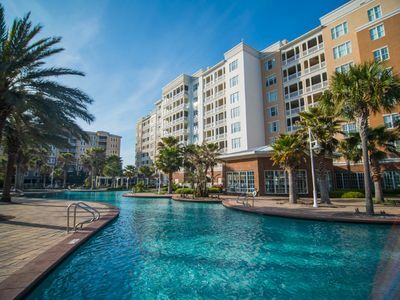 This is a 2 BR 2 BA professionally decorated Condo with all stainless steel appliances, high end furniture in the living areas, bedrooms and on the screened in balcony. The master BR has a king bed with a 55" smart TV. The second bedroom has a queen bed and a 55" smart TV. The living room has a 65" smart TV, all three are brand new. The kitchen and master bath have granite countertops and tile showers. The unit is appx 1300 sq ft The resort also has a 25,000 sq ft full service serenity spa and salon. Enjoy swimming in the huge 10,000 sq foot pool with hot tubs. You may enjoy a round of golf on the only Jack Nicklaus designed course in North West Florida. Walk down the pier to Pelicans and enjoy lunch or dinner, or have a drink and watch the awesome sunset. If you or the kids like to fish, walk down to the end of the pier and throw a line. You can also walk over to the beach area of the resort and get some sun. There are also jet skis as well as pontoon boats for rent, on site. There is so much to do at this resort, you will never be bored. 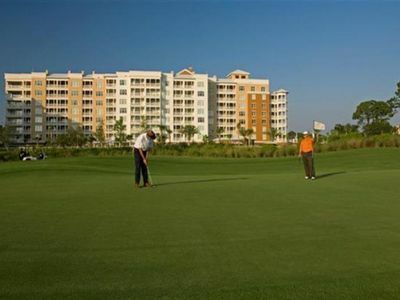 Bayfront Golf & Marina unit overlooks the Bay, Pool, & Golf Course! ***PLEASE NOTE: ALL RATES QUOTED BELOW ARE BASE RATES NOT INCLUDING TAXES OR FEES. *** 2 bedrooms, 2 baths, walk in shower and King bed in owners suite, queen bed in 2nd bedroom with a pull out twin, queen sleeper sofa in living room. 2nd bath has a tub/shower. 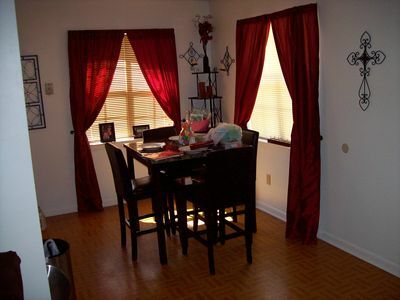 Fully equipped kitchen, updated appliances, washer/dryer, and all linens provided. Access to privately owned Lagoon pool & hot tub amenities are included as well. Walking distance to golf, tennis, restaurant, water activities, & tiki bars. Unforgetible Experience "THIS HOUSE WILL BLOW YOU AWAY"
"GORGEOUS BAY FRONT HOME with a panoramic view of Grand Lagoon on St Andrews Bay. This house is a great location for family gatherings. Lots of room for entertaining and outdoor space for kids to swim, paddle board, kayak, fish, bike ride or just relax. Optional 50' or a 24' Power Boat or jet skis for an additional fee. Also, for additional fee, you can leave the cooking to someone else with an in house Chef or catered meals. There is one thing for sure... Your family or special Guest will never forget this experience. We recently purchased this 2 bedroom, two full bath unit to use as a family weekend get away. This place is amazing! The prior owner hired a first-rate contractor who did an excellent job of making this a premier condo at Bay Point. The unit includes 70 oz. plush carpet in both bedrooms with solid bamboo flooring in the living/dining area. The entire condo was re-trimmed and beautiful wainscoting was installed in the entry and foyer as well as crown molding throughout. All appliances and light fixtures were replaced and are modern and new. There are flat screen TVs in both both bedrooms as well as in the living room. A gorgeous leather sectional can also be found in the living room area. You will love the local art work hanging on every wall, including "photo-on-canvas," a heavy oil painting over the dining room table, and a "redfish on wood" made out of bottle caps. An artist from Sarasota Fl. designed and custom built an impressive dinette set that also serves as a wine storage cabinet . ... feel free to enjoy a bottle on us! Both bedrooms include high high-end mattresses and the most comfortable linens, towels and pillows. Custom made rugs add a special touch to our unit. The Master bedroom includes a fabulous porch/balcony overlooking the huge lagoon pool and the gorgeous Bay. Believe me, you will be spending a lot of time out there...the view is outstanding! Our family has a history of being in the Florida restaurant business and we know what's needed in the kitchen. Here you will find a Keurig coffee maker as well as all the right pots and pans and key spices. There is also washer and dryer in the unit. The property grounds and amenities cannot be overstated. We are surrounded by a top rated golf course that includes areas for bike riding or perhaps just a leisurely stroll. The Bay itself offers many opportunities for fun, including pontoons, fishing, kayaking and jet skis. Our favorite: sitting on the private beach watching the sun set while boats come in off the Gulf. The Lagoon pool is enormous and the area features a hot tub, a separate heated pool, cabanas, tables and grills. Be sure to take advantage of The Serenity Spa services including morning yoga classes located on the 1st floor directly below our unit.. If your desire is to truly unwind and enjoy unique recreational opportunities, this is the place for you! We cherish our time at this luxurious unit and would love to have you as our guest! Exclusive Upgraded Features: Enjoy complimentary wireless high-speed internet access; and DVD Player. The two bedroom two bathroom unit offers 1298 sq ft of magnificent living space. The unit features a King in the master, a queen in the second bedroom, and a double sleeper sofa in the living room accommodating up to six guests comfortably. The private furnished balcony offers a majestic view of St. Andrew's Bay from the living room. All condominiums have fully-equipped kitchens, linens/towels, starter kits of coffee and toiletries, iron, laundry detergent, and washer/dryer. Reflections One Bedroom - Sleeps 4! Perfect for Golfers, Couples, Small Families! If you are looking for a romantic getaway or for a small family getaway look no further than this gorgeous one bedroom unit right on St. Andrew’s Bay. This fully furnished unit offers guests 905 square feet of magnificent living space, complete with all of the comforts of home and the luxuries of a high-end resort. From the fully furnished kitchen to the private balcony overlooking St. Andrew’s Bay, this condo defines what it means to relax in ultimate comfort and style. New installing vinyl plank flooring through out the whole unit installed 11/2018 The fully furnished kitchen has gorgeous granite counters, custom cabinets, modern appliances, two large sinks, and kitchen “extras” like a toaster, blender, cookware, utensils and elegant fixtures and furnishings make this the perfect place to work some magic and create a special meal for two or more. An overextended counter creates a snack bar on the far side of the kitchen, complete with four bar stools. Then when it is time for a more formal deal, gather around the perfect dining table overlooking the patio and tropical trees of the resort. The living room is complete with one plush leather sofa in front of an elegant oak cabinet and large flat screen TV. The upscale tile floors, high-end décor, and furnishings add to the elegance and sophistication of the entire unit. The TV also comes with a DVD player so you can snuggle up and enjoy a great movie or during the fall time catch your favorite football game on one of the premium channels! The single bedroom in this condo is roomy and inviting and offers a king size bed with soft linens and black out drapes to make your sleeping in even better! This large bedroom has a private master bathroom, complete with two sinks and a glass walk-in shower. Granite counters, large vanity area and plenty of storage space makes this a comfortable place for two people to get ready for or wind down from a busy day. When you’re ready to venture out onto the resort, you’ll be pleasantly surprised at all of the amenities available for you to use. Spend the day out by the 10,000 square foot tropical resort pool, a full service spa, golf courses and two popular restaurants (some additional fees may apply for some amenities.) The pool has plenty of loungers for you and your loved ones to soak up the sun, and the view of the bay from the pool is unbelievable. There are shaded tables and chairs by the pool where you can enjoy lunch, cabanas, hot tubs and the “zero-entry” style of the pool makes it easy to casually wade in the water while sipping a cool drink. Nearby, there are dozens of local restaurants, both casual and fine dining, that you must try while you’re here. Guests of the resort can also take advantage of discounts on local attractions like fishing trips, dolphin excursions, boat and wave runner rentals, and more. This amazing one bedroom unit is a perfect place for a honeymoon, anniversary or romantic trip “just because” or for you to bring your small family with you to enjoy all the great amenities the resort has to offer! The resort offers plenty of quiet and private places to relax with your loved ones, but also offers activities and events if you want to get out and meet other people. You will love every minute you spend on the resort, in the unit, and exploring the local area. Panama City Beach is waiting for you! Top Floor Unit at Reflections! 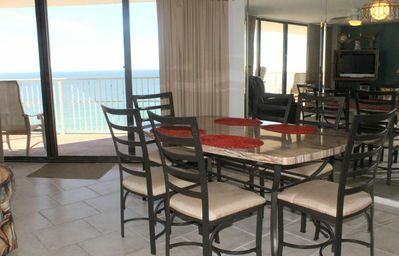 Amazing Views, Perfect for your Panama City Beach Getaway! For ultimate comfort and relaxation in Panama City Beach, there is only one place you’ll find all of the comforts of home, combined with all of the luxuries of a five-star resort. 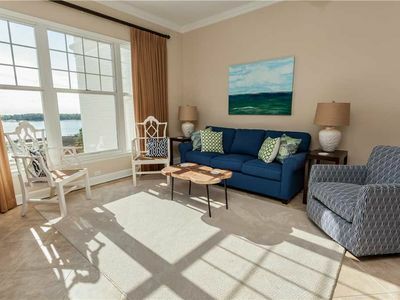 Reflections 805 is a spacious, two bedroom unit that overlooks the crystal blue waters of St. Andrews Bay. It has a fully furnished kitchen, large living spaces, quiet and private bedrooms, upscale bathrooms and a balcony overlooking the water that will leave you speechless. This unit has 1298 square feet of living space, making it a comfortable place for up to six guests to enjoy while staying on the bay. The fully furnished kitchen has custom cabinets, beautiful granite counter tops, all of the cookware and utensils that you'll need, bonus amenities like a toaster, high end coffee maker and coffee grinder for all you coffee lovers out there, a blender for whipping up specialty drinks, and a crockpot for when you want to enjoy a nice home cooked meal without all the fuss. Whether you use the kitchen to reheat leftovers from some of the incredible restaurants nearby, or you whip up gourmet dinners for the whole family each night, this kitchen is the perfect space to do it in. A formal dining room extends off of the kitchen, complete with a large dining room table and seating for six. This comfortable space is a great place to come together at the end of a busy day to share a meal and great conversation. 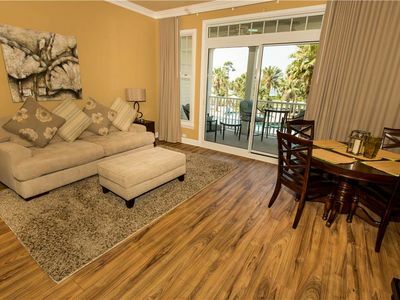 The beautiful hardwood floors throughout the unit, combined with the upscale fixtures and furnishings, soft lighting, comfortable furniture and beach décor really transform this unit into a bay resort getaway. The formal dining room transitions easily into the spacious living room. This room has one large, plush sofa and two comfortable armchairs. No matter where you sit, you’ll have a great view of the 55 inch flat screen curved ultra HD 4K TV with extended cable and surround sound. The sofa easily turns into a Queen size bed, giving you even more sleeping options for additional guests. This unit has a private balcony, set up with high-end patio furniture and sun lounger so everyone can sit back and enjoy the view. Early birds can tip toe to the kitchen for some coffee and then sneak out to the balcony to watch the beach “wake up.” Night owls can grab a drink and some snacks and retreat out to the balcony to watch the sun go down and the nightlife come alive. From the balcony, you have a great view of the resort’s pool dotted with palm trees and greenery. The first bedroom has a King size bed, gorgeous dresser and night stand set, flat screen TV and private bathroom. This bedroom also has private access to the balcony. The bathroom has a glass, walk-in shower, hardwood floors and beautiful vanity area. The second bedroom has a Queen size bed and flat screen TV. The second bathroom has a shower/tub combo perfect for those that want to unwind with a hot bath. This amazing two-bedroom unit is the perfect place to come home to after a day of exploring the resort and surrounding area. The Reflections Resort has a 10,000 square foot tropical pool, full service spa and salon, golf courses and tennis courts. (Additional fees may apply for golf, salon/spa) There are two restaurants on site, Pelicans and Club 19. Nearby, there are countless local restaurants that you MUST try! Guests of the resort receive discounts on local area attractions like fishing trips, Jet Ski rentals, snorkeling, boat rentals, dolphin excursions and more. Guests can also receive discounts on food in the area, such as pizza places, seafood restaurants, ice cream shops and other casual or fine dining spots in the area. This impressive unit is just a few miles from the beach, making it an ideal location for families who plan on spending their vacation soaking up the sun. Families love how convenient it is to wake up, spend the morning by the pool, come home for lunch, head out to the beach, and come back home to shower and dress for a night out. 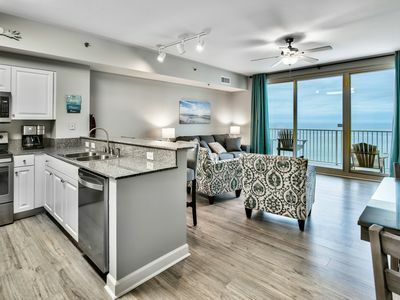 The location, along with the five-star amenities, makes this unit a “must-do” when traveling to Panama City Beach. Reflections Condo for Two! Perfect Getaway to the Bay. Spa/Golf/Restaurants! 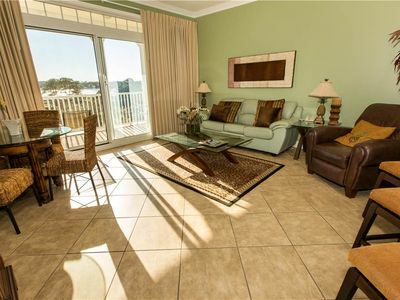 If it is romance, tranquility, comfort, and convenience you’re looking for your next Panama City Beach Vacation, look no further than this gorgeous one bedroom unit right on the Bay. This fully furnished unit offers guests 905 square feet of spectacular living space, complete with all of the comforts of home and the luxuries of a high-end resort. From the fully furnished kitchen to the private balcony overlooking St. Andrew’s Bay, this condo defines what it means to relax in ultimate comfort and style. The fully furnished kitchen has gorgeous granite counters, custom cabinets, modern, stainless steel appliances, two large sinks, and kitchen “extras” like a toaster, blender, cookware, utensils and elegant fixtures and furnishings make this the perfect place to work some magic and create a special dish. An overextended counter creates a snack bar on the far side of the kitchen, complete with four bar stools. Then when it is time for a more formal deal, gather around the gorgeous wooden dining room table overlooking the patio and tropical trees of the resort. The living room is complete with one plush sofa in front of an elegant oak cabinet and large flat screen TV. The hardwood floors, a soft and welcoming color scheme, and high-end décor and furnishings add to the elegance and sophistication of the entire unit. The TV comes with a DVD player, so you can enjoy a movie with your sweetheart! The single bedroom in this condo is roomy and inviting and offers a comfy queen size bed with soft linens and plenty of pillows. This large bedroom has a private master bathroom, complete with two sinks and a glass walk-in shower. Granite counters, gorgeous backsplash, large vanity area and plenty of storage space makes this a comfortable place for two people to get ready for or wind down from a busy day. When you’re ready to venture out onto the resort, you’ll be pleasantly surprised at all of the amenities available for you to use. Spend the day out by the 10,000 square foot tropical resort pool, a full service spa, golf courses and two popular restaurants (some additional fees may apply for some amenities.) The pool has plenty of loungers for you and your loved one to soak up the sun, and the view of the bay from the pool is unbelievable. There are shaded tables and chairs by the pool where you can enjoy lunch, cabanas, hot tubs and the “zero-entry” style of the pool makes it easy to casually wade in the water! Nearby, there are dozens of local restaurants, both casual and fine dining, that you must try while you’re here. Guests of the resort can also take advantage of discounts on local attractions like fishing trips, dolphin excursions, boat and wave runner rentals, and more. This amazing one bedroom unit is a perfect place for a honeymoon, anniversary or romantic trip “just because.” The resort offers plenty of quiet and private places to relax with your hunny, but also offers activities and events if you want to get out and meet other people. You will love every minute you spend on the resort, in the unit, and exploring the local area. Panama City Beach is waiting for you! #803 at Reflections! Perfect Two Bedroom with PANORAMIC views of St. Andrew's Bay! Are you looking for a peaceful vacation perfect for a couple or a small family? You have reached your destination. Welcome to 803 at Reflections! A beautifully laid, spacious, two bedroom unit that faces the beautiful St. Andrew's Bay. It has a fully furnished kitchen, large dining area and living area, quiet and private bedrooms, upscale bathrooms and a balcony overlooking the water that will leave you speechless. This unit has 1298 square feet of living space, making it a comfortable place for up to six guests to enjoy while staying on the bay. The fully furnished kitchen has beautiful wood cabinets and drawers filled with all the cookware and utensils you should need along with granite counter tops for preparing a delicious meal for your family. This unit also has a Keurig for all you coffee lovers on the go and a blender for whipping up specialty drinks after a night out. This kitchen is perfect for simple meals or an elaborate dinner! A formal dining room extends off of the kitchen, complete with a large dining room table and seating for six. This comfortable space is a great place to come together at the end of a busy day to share a meal and great conversation. The unit has tiled floors throughout the kitchen and living room with the upscale fixtures and furnishings, comfortable furniture and beachy décor. The formal dining room transitions easily into the spacious living room. 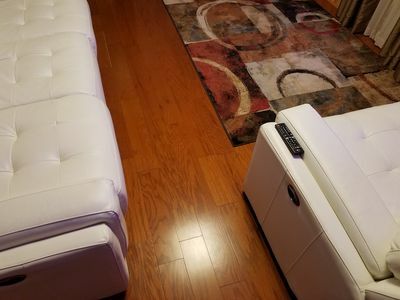 This room has one large couch and a few chairs perfect for relaxing and enjoying a movie on the flat screen TV with Extended HD Cable TV Channels. The sofa easily turns into a Queen size bed, giving you even more sleeping options for additional guests. This unit has a private balcony, set up with high-end patio furniture so everyone can sit back and enjoy the view. Early birds can tip toe to the kitchen for some coffee and then sneak out to the balcony to watch the beach “wake up.” Night owls can grab a drink and some snacks and retreat out to the balcony to watch the sun go down and the nightlife come alive. From the balcony, you have a great view of the resort’s pool dotted with palm trees and greenery. The first bedroom has a King size bed, flat screen TV and private bathroom. This bedroom also has private access to the balcony. The bathroom has a glass, walk-in shower, and beautiful vanity area. The second bedroom has a Queen size bed and flat screen TV. The second bathroom has a shower/tub combo perfect for those that want to unwind with a hot bath. This amazing two-bedroom unit is the perfect place to come home to after a day of exploring the resort and surrounding area. The Reflections Resort has a 10,000 square foot tropical pool, full service spa and salon, golf courses and tennis courts. (Additional fees may apply for golf, salon/spa) There are two restaurants on site, Pelicans and Club 19. Nearby, there are countless local restaurants that you MUST try! Guests of the resort receive discounts on local area attractions like fishing trips, Jet Ski rentals, snorkeling, boat rentals, dolphin excursions and more. Guests can also receive discounts on food in the area, such as pizza places, seafood restaurants, ice cream shops and other casual or fine dining spots in the area. This impressive unit is just a few miles from the beach, making it an ideal location for families who plan on spending their vacation soaking up the sun. Families love how convenient it is to wake up, spend the morning by the pool, come home for lunch, head out to the beach, and come back home to shower and dress for a night out. The location, along with the five-star amenities, makes this unit a “must-do” when traveling to Panama City Beach. 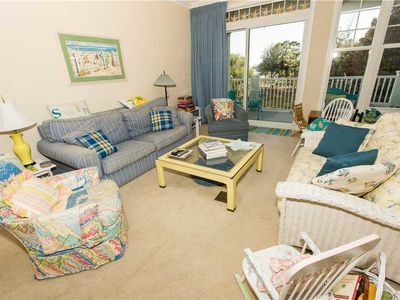 For a relaxing vacation experience, treat your family to an extended stay in this beachy themed, fully furnished condo. 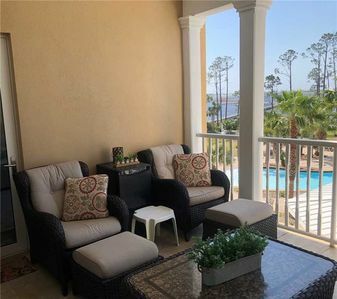 From the well stocked kitchen, spacious living room and breathtaking patio, to the updated bathrooms, comfortable bedrooms and variety of bonus features, this three-bedroom unit is the perfect addition to your upcoming Panama City Beach vacation. You’ll notice right away that this condo is made for a vacation getaway. 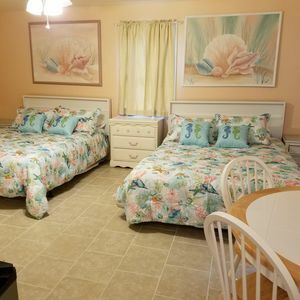 From the bright color schemes throughout the unit to the attention to detail and beach themed décor in the bedrooms, you’ll really feel like you’ve escaped to the beach in every room of this home. The kitchen is fully furnished with all of the appliances, cookware and utensils you’ll need to feed a small army. The refrigerator, microwave, stove, double sinks, and dishwasher make preparing, cooking, and cleaning up after a meal a breeze. A bonus snack bar creates a casual place to hang out and enjoy a drink as well. Whether you plan to use the kitchen to heat up leftovers from some of the local restaurants, or you plan to cook your family’s favorite meals, the kitchen gives you the space and the tools you need to do it. The open living room provides plenty of seating for the whole family. Two couches, multiple armchairs, and dining room with plenty of chairs ensures everyone has a great spot in this spacious living area. A Flat Screen TV with DVD player makes it easy to set up a family movie night after spending the day out by the pool or at the beach. This is a corner unit, so get even more patio space than a typical unit in this resort. The patio is shaded, so you can enjoy the bay breezes without getting too much sun. Right outside of the living room is the private patio, a peaceful place to enjoy coffee in the mornings or mingle with family members after dinner. The private balcony has colorful patio furniture and overlooks St. Andrew’s Bay. You’ll love the view from here, and will want to take a few family photos from this picturesque spot. When you are ready to go out and explore, you’ll be impressed with everything the resort has to offer. 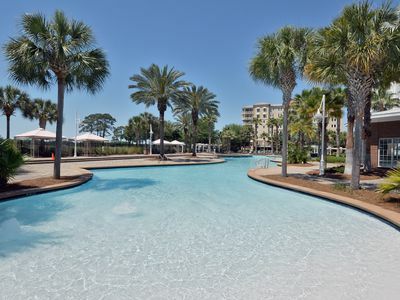 Spend the day at the 10,000 square foot resort style pool, treat yourself to a day at the spa and salon, work up a sweat at the fitness center, give shuffleboard or tennis a try, or take a swing one of the championship style golf courses right on the property. When you’re hungry, check out one of two excellent restaurants, Pelicans and Club 19. Just off of the resort, there is even more to do! You can’t come here and not spend a day at Shell Island, and guests of the resort can take advantage of the complimentary shuttle to and from Shell Island. There are shopping centers, restaurants, sidewalk boutiques, theme parks, public parks, hiking and biking trails and of course, the beach all nearby. Guests of the resort also get discounts on local attractions like dolphin excursions, fishing trips, boat rentals and deals on both casual and fine dining restaurants. When the sun goes down and it is time for bed, your family can rest peacefully in one of three private bedrooms. The first bedroom has a King size bed, the second bedroom has a Queen and the third bedroom had two twin beds. The twin bedroom is geared for kids and has plush animal toys and kid size chairs to make the younger guests feel comfortable. The master bedroom has a private bathroom with a glass, walk-in shower, tiled floors, and a beautiful vanity space. The other two bathrooms have a tub/shower combo, plenty oh high-quality towels, and plenty of closet space. Your vacation time is priceless; you can’t afford to spend it in some questionable hotel miles away from everything. This gorgeous corner unit has unbelievable views, spacious bedrooms, upscale bathrooms, and all of your comforts of home. Surprise your family with a trip to Panama City, and stay at a resort that they’ll remember forever. 6th Floor Condo at Reflections in Bay Point. You do not want to miss this! If you’re looking for total relaxation, a cozy and comfortable condo facing the bay, and plenty of amenities right on site, you’ve found the perfect condo! 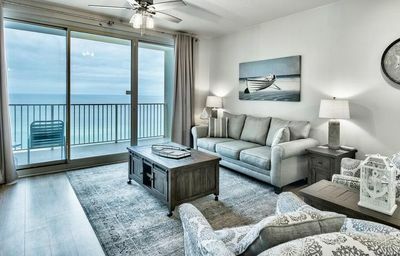 Once you step inside this beautiful, well equipped and spacious unit, with 1298 square feet of living space, accommodating up to six guests, with features such as complimentary wireless internet, washer and dryer, and all the necessities to have the perfect vacation, you will not want to go home! When you arrive at the resort, you’ll notice all of the incredible things waiting for you to dive into. There is a stunning resort-style pool, full-service spa and salon, tennis courts, golf courses and free parking. There are restaurants such as Club 19, Pelicans, and Bricks & Barley for those who do not want to venture far. If you’re looking for an adventure outside of the resort, our guests receive discounts to local area attractions such as water parks, dolphin excursions, fishing trips, and boat rentals. Surrounded by St. Andrew’s Bay, the Gulf of Mexico and a beautifully designed golf course, the views from every point on the resort will take your breath away. Sit alongside the pool under the rows of tropical palm trees and enjoy a nice cool drink, or wake up early and enjoy the sprawling golf course right on site. There is beauty all around you, making this a perfect place to get some peace, quiet, and relaxation. This particular unit has two large bedrooms, a fully furnished kitchen, formal dining area, large living room, two bathrooms and a private, shaded balcony overlooking the water. The fully furnished kitchen has all modern appliances, custom cabinets, granite counter tops, and kitchen “extras” like a blender, coffee maker, toaster, and all of the cookware and utensils that you will need to whip up a quick meal or if you’re wanting to cook something more gourmet. At the end of the day, everyone can find a spot at the dining room table to enjoy a good meal with their family. The formal dining area has a beautiful wooden table that seats 6, and combined with the snack bar, creates a comfortable dining space for the whole family. 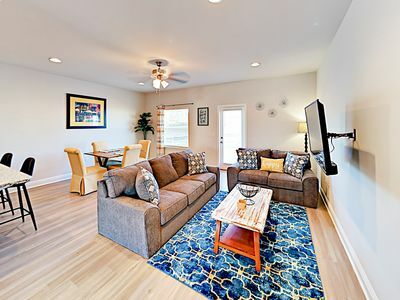 The living room is comfortable and spacious with cozy furniture awaiting you and your family to snuggle and watch your favorite show or possibly a new movie on the flat screen TV. The large windows in the living room look out over the resort and tropical pool. Outside, a shaded patio with upscale patio furniture creates a peaceful place to enjoy some coffee, read a book or even take a nap. There are two bedrooms in this luxurious unit, one with a King size bed and one with a Queen size bed. The first bedroom has private access out to the patio where one can enjoy the sweeping views of the bay. It also has its own private bathroom, complete with a glass, walk-in shower and double vanity. The PERFECT place for two people to get ready for their day. The second bathroom has a shower/tub combo for those who need a quiet, relaxing, hot bath at the end of a long day at the beach. Both bedrooms have high-end mattresses and soft linen, elegant décor and modern fixtures and furnishings. The bedrooms are roomy and spacious and create a peaceful place to relax after a busy day. 608 is a beautiful unit waiting just for you and your family. If you need to get away and enjoy a peaceful and rejuvenating time, definitely take a chance on this home. Updated and Beautiful Two Bedroom Condo at Reflections! Unit 211 at Reflections is a cozy and spacious two bedroom unit overlooking St. Andrew's Bay. It has a fully furnished kitchen, large living area, two separate bedrooms, upscale bathrooms and a balcony overlooking the golf course and Bay that will make all your worries vanish away. This unit has 1298 square feet of living space, making it a comfortable place for up to six guests. The fully furnished kitchen has custom cabinets, granite counter tops, and all of the cookware and utensils that you'll need to create a meal for you and your family. Whether you use the kitchen to reheat leftovers from some of the incredible restaurants nearby, or you whip up gourmet dinners for the whole family each night, this kitchen is the perfect space to do it in. A formal dining room extends off of the kitchen, complete with a large dining room table and seating for six. This comfortable space is a great place to come together at the end of a busy day to share a meal and great conversation. The formal dining room transitions easily into the spacious living room. In here you will find comfortable furnishings along with a flat screen TV to enjoy your favorite shows or a movie with your friends or family. The master bedroom has a king size bed with nice furnishings including private access to the balcony. The bathroom has a glass, walk-in shower, and beautiful vanity area. The second bedroom has a queen size bed with the second bathroom having a shower/tub combo perfect for those that want to unwind with a hot bath. This two-bedroom unit is the perfect place to come home to after a day of adventuring the resort and surrounding area. The Reflections Resort has a 10,000 square foot tropical pool, full service spa and salon, golf courses and tennis courts. (Additional fees may apply for golf, salon/spa) There are several restaurants on site. Nearby, there are countless local restaurants that you MUST try! Guests of the resort receive discounts on local area attractions like fishing trips, Jet Ski rentals, snorkeling, boat rentals, dolphin excursions and more. 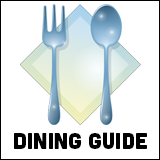 Guests can also receive discounts on food in the area, such as pizza places, seafood restaurants, ice cream shops and other casual or fine dining spots in the area. 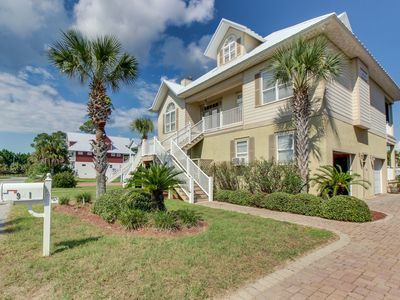 This unit is just a few miles from the beach, making it an ideal location for families who plan on spending their vacation soaking up the sun. Families love how convenient it is to wake up, spend the morning by the pool, come home for lunch, head out to the beach, and come back home to shower and dress for a night out. The location, along with the five-star amenities, makes this unit a “must-do” when traveling to Panama City Beach. 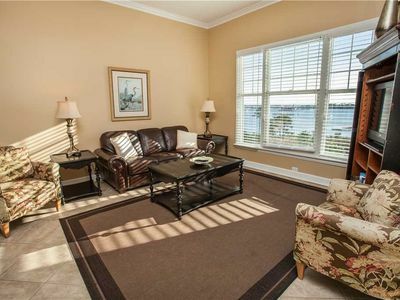 Gorgeous Completely Renovated Two Bedroom Unit RIGHT on the Bay! Step inside this amazing two bedroom unit at Reflections that has been completely renovated with new appliances, flooring, furniture, EVERYTHING On top of all the wonderful upgrades, this unit features complimentary use of the Serenity Spa's Fitness Center! Are you looking for a little rest and relaxation where you can sit back and look out on the beautiful waters of St. Andrew's Bay? If so, you've looked in the right spot. This unit, 504, on the 5th floor at Reflections has impeccable views and a cozy updated inside. The unit is fully furnished with a fully stocked kitchen with every appliance and utensil you should need to cook a delicious meal for your family. 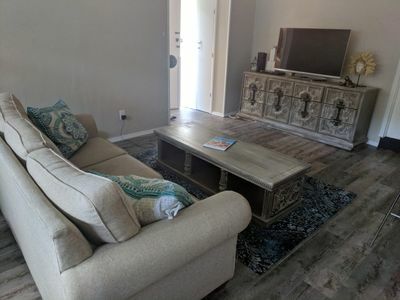 Along with the beautifully updated kitchen with its stainless steel appliances, the living room features a flat screen TV with a comfy sectional sofa to unwind after a long day at the beach or fishing. Both bedrooms in this beautiful unit have hardwood flooring with brand new bedding and mattresses so you can enjoy a peaceful night's rest and wake up refreshed for your adventures for the next day! The unit also has two bathrooms, one with a gorgeous walk in glass shower right off the master bedroom and the other in the hallway for your guests to enjoy. Whether you are looking for a place for a week's long vacation on the Bay or need something relaxing for your next work visit, Reflections at Bay Point is the perfect place. There are several restaurants that are located within the Bay Point area so you do not have to go far to grab a bite to eat, including Pelicans and Tides which are both located at the Sheraton Hotel next door. There are also two 18 hole golf courses and clay tennis courts. In addition to all the fun outdoor activities there is a full service spa and salon on the ground floor of our building. We hope that you choose this beautiful unit for your next stay, you won't regret it! Amazing Views from this Gorgeous, Platinum 6th Floor Unit at Reflections! This beautiful two-bedroom unit is the perfect place for a small family or a group of close friends looking for the perfect beach getaway. It’s located on the 6th floor at Reflections in Bay Point and has breathtaking views of St. Andrew’s Bay and our gorgeous lagoon style saltwater pool. This unit is PLATINUM rated and is a guest a favorite! The unit features the following: •	Living Room with Bay Views •	Master Bedroom with King Bedding & Bay View with adjoining private bath and double vanity sinks and beautiful glass shower •	Second bedroom – Queen Bedding •	Second bathroom includes a tub/shower combo •	3 Flat Screen TV’s •	Fully Equipped Kitchen with all the necessary cookware and utensils •	Washer and Dryer Unit also includes complimentary Wi-Fi and a starter kit of amenities that we provide which includes shampoo, conditioner, lotion, toilet paper, paper towels, and laundry soap. In the area, there is plenty for you and your family to do including swimming in our big pool, soaking up the beautiful sun. If you are a golfer, there are two 18-hole championship golf courses that are beautifully landscaped. There is also an upscale Serenity Spa that offers all types of treatments. Including these great amenities, there are several restaurants and a marina!